A few weeks of searching for my inspiration, I recalled having a trip with my husband, Chung-Yen. He told me about how his mother raised him when he was a little child; it was full of love. She stretched in so many directions, she kept chicken, fish and pig; she grew rice, vegetables, etc. she was such a busy farmer and those different tasks have made her full of multi sweet smells of a mother. The dress on her was very simple and elegant. The only fabric that showed her grace and elegance was plant dyed fabrics. I searched for plants to dye by myself. The natural smell from the sap of the plants while using an extract just like the dishes his mother cooked. The smell of the dyed fabrics had the smell of plants, too. It was my first challenge to hand stitch the portrait of my husband and his mother. 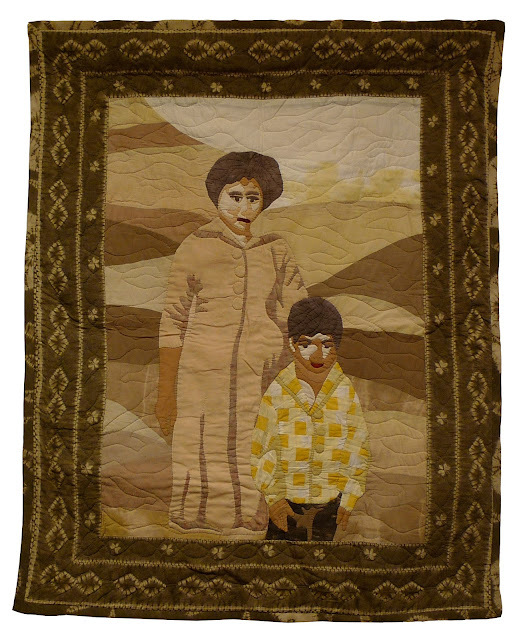 I hope people can see the love of mother from this quilt. This little quilt was stitched for my husband, Chung-Yen. I used plant dyed fabrics as the materials. The plant was from his mother’s garden in the backyard where was her favorite during her lifetime. I didn’t use any bright color dyed fabrics. I hope she could understand how much her children miss her! Hsin-Chen, what a beautiful, poignant piece. I love that you used the plants and scents from her garden to create the colors. Your husband must be very pleased. The direction of challenge is multipled but the plants dye and aroma is the key. This was tough for me to do because I am used to create quilts with multicoloured fabrics. You've really taken the challenge to heart with this piece. Literally making the aroma of the plant dyes part of the experience of making the quilt. It's a wonderful tribute to your husband and his mother. Your observation is very careful. I spent courage and honesty even more than ever. I recalled a lot during the process and my husband has involved with this. I again think that quilts are such an amazing creative medium. 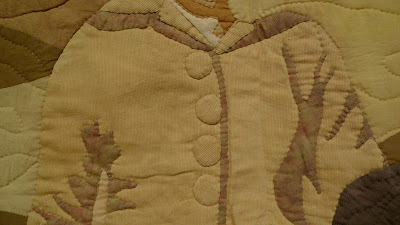 I am so impressed that you plant dyed the fabrics...so much meaning stitched into this piece. As Kate said, it is a beautiful tribute to both your husband and his mother. Everyone has their favorite part towards living environment. It is wonderful to use art to keep the love. This motivation is beyond whether if the piece can receive a good evaluation. I am glad to have this piece finished. What a wonderful sepia colour palette from the plant dyes. I love the border piece too and the wonderful tribute to your mother-in-law. I spent much time to do the plants dye to generate the sepia colour. I seldom use the border method over year. Anyway it took me much time to dye the fabrics and stitch it. I am glad to have this piece finished.